Bart Swings, a current world champion in inline skating is looking to add an Olympic medal to his collection. The olympics continues to surprise and in that sense, today was unsurprising. Once again, it was Zhang from China setting a very fast time early in the start order when she left the olympic champion Nesbitt in her wake, even crossing lanes over the top of her in the final lap. Despite being made to look like a beginner, Nesbitt stayed in second position all the way until pair 14 (of 18) when Marrit Leenstra of the Netherlands slipped into second. Then one by one, they tried… Richardson in pair 15, Boer and Fatkulina in pair 16 then slipped into 2nd and 3rd. In the next pair world record holder Bowe died in the last lap while 3k gold medallist Ireen Wüst slipped into second, and in the final pair Lotte van Beek and Lee Sang Hwa failed to make an impression, leaving Hong Zhang, who surprised us all in her 500m with an unexpectedly fast first race, with the gold medal – China’s first in speed skating, and their third medal for this Olympics and second gold, their first one coming in the ladies 500m in short track just a few hours ago. We get a little break now. There’s a day-long break in the speed skating competition presumably to give athletes more time to recover if they are fortunate enough to be competing in both the 1000m and the 1500m, so this gives us a whole extra day to build up the anticipation for the men’s 1500m event. I may entertain my readers with another feature article while we wait, but for the moment, let’s have a preview of the race which will take place in two days. The men’s 1500m is traditionally a difficult event to predict because of the nature of energy systems used to skate it. 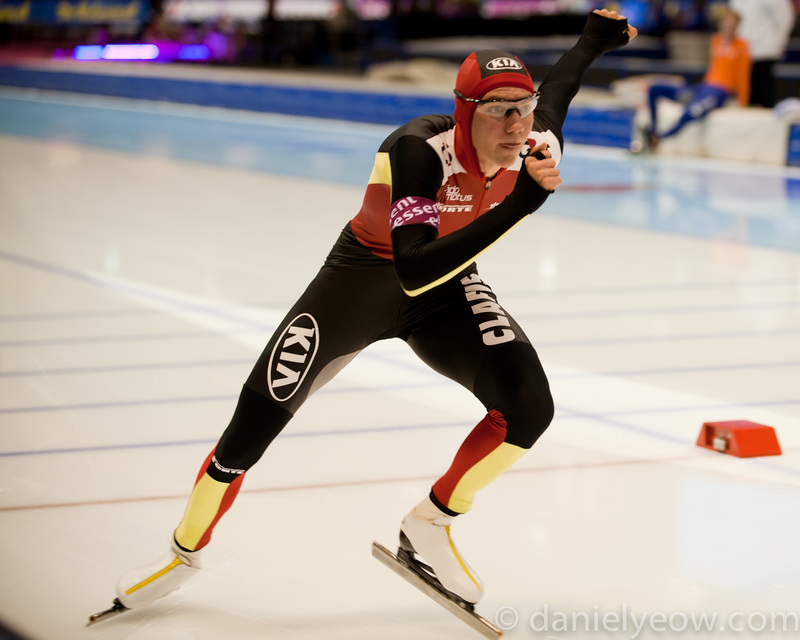 The current world champion at the distance is Bart Swings of Belgium (pictured) who simultaneously competes in Inline Speed Skating in the summer, as well as ice skating in the winter, although so far unsuccessful at world championships, he has won world cup races in the past and is a part of the growing number of inline skaters who have not only transitioned to ice, but also compete in both simultaneously (Michel and Ronald Mulder being other notable examples). The world record holder in the event, is Shani Davis who will be hungry for a medal after not performing as expected in the men’s 1000m where he was heavy favourite. Koen Verweij, Denis Yuskov, and Joey Mantia each also have victories in the world cup events leading up to the games, and are all capable of taking the win. Looking at the world cup rankings reveals that the Norwegians are a credible threat in Håvard Bøkko and Sverre Lunde Pedersen, as are the Poles in Zbigniew Brodka, and Konrad Niedzwiedzki (try saying that 10 times in a hurry). Looking further down the list reveals junior world record holder Brian Hansen from the US, former world record holder and winner of the silver medal Denny Morrison of Canada, and the gold medalist from Vancouver, Mark Tuitert of the Netherlands. Although I’ve so far been able to predict at least one of the medalists for all of the past events, I have a feeling that this race is sufficiently unpredictable that my three picks may finish entirely outside of the medals. For the win, Denis Yuskov who is a proven 5k skater, but those who watched his race would be forgiven for thinking that he was racing everyone to the 3k mark, has the distance in his legs to finish strong in the 1500m. In second, I’m picking dutch skater Koen Verweij who is skating at his first Olympics, also comes from inline skating, and from what I know of him (more than can be printed in a public forum such as this) he has the ability to really dig deep and find that little bit extra when the thighs are burning. For the bronze, Bart Swings just ahead of Shani Davis, because I think Swings will have the legs to put in a stronger last corner despite Shani’s proven ability in the distance. Of course, there’s a good chance that somebody who I haven’t even mentioned wins the gold medal – it happened last time when Mark Tuitert beat Shani for the gold (Shani was heavy favourite having broken the world record in the 1500m only two months previously), and Mark hadn’t won anything all year. The 1500m is the most difficult distance to race. All long track races are, by definition, maximal efforts since they are simply races against the clock. What makes the 1500m especially difficult is that is smashes all of your energy systems. Speed skating is all about power, and the idea is to expend the maximal amount of energy over the course of a race. In the 500m, which goes for less that 40 seconds, you use up your creatine phosphate, then start digging into your anaerobic energy systems. Most of the race is alactic, and depending on your physiology, you’ll usually feel a little bit of lactic acid near the end – anaerobic lactic. In the 1000m, the distance is long enough to well and truly delve into your anaerobic lactic energy systems, and you could see it on their faces in the last corner. In the 1500m however, you can expect to exhaust your anaerobic energy systems – just. And that is why the result is so difficult to predict. If you go a little too hard at the start, you’ll explode and have nothing left for some part of the race, but if you don’t go hard enough then you won’t race your fastest race. Getting this mix just right is very difficult, and the slow ice conditions will mercilessly punish anyone who gets it wrong. When you skate at altitude, it is very slightly easier to get the mix right because first of all, because the conditions are faster, you can expect to be skating for 3-4 seconds less than you would at a low-altitude venue (that’s about half a straight), and secondly when you do start to die, the fast ice allows you to maintain a higher speed for less effort and you can sort of limp around the last corner and still carry a decent amount of speed – not so on slow ice. I’ve generally picked skaters for the medals who have proven themselves in longer distances, because while that kind of conditioning can take the edge off your top speed in record-setting, high altitude conditions, when the ice is slow, that conditioning can substantially slow the drop off in speed towards the end of a race. Everyone I’ve picked has a history of high placings in longer distances (and Yuskov unofficially broke the world record in the 3k three months ago in Calgary). Similarly to the 1000, there are two basic approaches to the 1500m – either reach a very high speed very quickly and then try to ‘drop’ as slowly as possible, or reach a somewhat lesser speed, but then use that saved effort to put in 2nd and 3rd laps which are not much slower than the first. Skaters like Shani, and Denny, who have very high top speeds will be going with the first approach, while skaters like Skobrev and Pedersen will be skating their last two laps with almost no discernible drop in speed. Don’t forget to click on the sochi2104 tag below to read other articles about these olympics. You may also want to read about the difference between ice and inline skating. Also don’t forget about the ‘Sochi Specials’ of which there are now two – concerning the speed suits that the skaters wear, and the difference between long track and short track. Any feedback or suggestions for questions to answer or things to write about are welcome.